The fish embryotoxicity test (FET) in zebrafish was used to identify toxicological hotspots along the Atoyac River, Mexico, to determine the presence of chemical substances with teratogenic effects for a possible monitoring program. Surface water samples were taken from eight stations along the river. We measured 18 physicochemical parameters and toxicity was determined through lethal dilution 50 (LDil50) test for each station. Further dilutions were made for malformations evaluation; delayed development and heartbeat frequency were registered as well. Multivariate cluster analysis was applied to characterize pollution sources and environmental quality. Two groups of stations were distinguished based on malformations lethality, which correspond to cluster analysis; COD and phosphate levels were close related. Malformations were obtained with all the samples and all dilutions, ranging from 1: 900 to 1: 66,000 and heartbeat frequency diminished with the dose. Even though the toxic effects were reduced with the river movement, lethality and teratogenicity were high in all stations, demonstrating a potential risk along the whole zone, where the river provides for agriculture and other human activities. Adoption of FET will provide an easy methodology for monitoring the efforts to reduce the pollution in the Atoyac River which is considered the most polluted river in Mexico. The fish embryotoxicity test (FET) has been introduced as an alternative to study chemical toxicity in aquatic ecosystems in vivo (Braunbeck et al., 2005, Seok et al., 2008). Several researchers have used the test for the risk assessment of wastewater treatment plant effluents (Karadima et al., 2010, Gartiser et al., 2010) and to study the water quality of rivers in Greece and Brazil (Botelho et al., 2013, Rocha et al., 2011). It has even been used to assess the risk of uranium polluted water as well (Barillet et al., 2011). Its utility for risk assessment of environmental chemicals goes beyond acute exposures and mortality, providing information on teratogenic effects and long term effects to the descendants. The test is easy, fast and reveals the bioavailability of chemicals in polluted water and its level of toxicity. The goal of this work was to identify toxicological hotspots along to the Atoyac River, including industrial wastewater discharges, and to determine possible presence of chemical substances with teratogenic effects, using the FET in zebrafish with the ultimate goal of establishing a test biomonitoring program for polluted rivers. The Atoyac River is the main stream located in the upper Balsas basin and flows from the Iztaccihuatl volcano to the Valsequillo dam with a longitude of 2,000 km with 5,000 km2 of hydrological surface (Saldaña and Gómez, 2006). Along the river there are 23 sewer pipes discharging industrial wastewater from three industrial corridors, a petrochemical plant, and at least 18 textile industries which exceed the limits of pollutants in the Norm (NOM-001- SEMARNAT-1996; Saldaña and Gómez, 2006). According to a report from the Mexican Institute of Water Technology (CONAGUA, 2008) more than one hundred chemical substances are present in the surface water of the river Atoyac such as arsenic, benzene, dichlorobenzene, vinyl chlorine, toluene, diethylphthalate, phenols, cadmium, nickel, lead and others. Since 1995, the river is being polluted by both industrial and municipal discharges (Sandoval et al., 2009). In addition to the resident discharge sites there are clandestine, sporadic discharges in varying points of the river, from tank-trucks carrying waste of undetermined origin. Along to the Atoyac River, there are small towns as San Martín Texmelucan, Villa Alta, Santa María Moyotzingo and Santa Ana Xalmimilulco, with a total population of 91,872 people living inside a strip of one kilometer at both sides of the river (CONAGUA, 2008). In recent years, inhabitants of these towns noticed an increase of several diseases among the young, including asthma, leukaemia, thrombocytopenic anemia and renal insuffiency. No data bases are available to determine whether these illnesses have really increased or whether their frequency is just a perception of the people. A study by Montero et al. (2006) demonstrated that these individuals carry increased genotoxic damage compared to persons living 7 km away from the river. In water samples of the Atoyac and its tributary, the Xochiac River, high concentrations of chloroform, methylene chloride, toluene and aniline have been repeatedly detected, as well as benzene and benzene compounds, among many others chemicals in lesser amounts (Navarro, 2004; CONAGUA, 2008). For these reasons, in addition to analytical determinations of the water quality, studies are needed to identify possible toxic hotspots along this stream. Eight superficial water samples were collected from the Atoyac and Xochiac rivers, including industrial discharges as shown in Figure. 1 and Table 1, covering a distance of 12 km. The samples were taken in triplicate and filtered using grade No.1 Whattman paper. Temperature, pH, dissolved oxygen (DO), total dissolved solids (TDS) and REDOX potential (ORP) were evaluated in-situ, using the multiparameter Hanna Instrument (HI 9828 model). Chemical oxygen demand (COD), PO4, NO2, NH3, AL3 +, Cr VI, Zn and Ni were evaluated at the laboratory once the samples were at room temperature, using the multiparameter photometer Hanna Instruments (HI 83099 model). All the samples were stored in glass amber vials (0.500 L) and transported at 4°C. Data were analyzed using a hierarchical cluster analysis on Minitab® for Windows 12.21. Figure 1: Study area. Numbered squares correspond to stations on the rivers. Numbered circles correspond to industrial discharges. 1-Villa Alta, 2-IDQC, 3-IDVA, 4-Tepetitla, 5-IDMO, 6-San Rafael, 7-Xochi, 8-Confluence. See Table 1 for coordinates. R: River sample D: Industrial discharge sample. Table 1: Localization of the sampling stations used in this study. Zebrafish (Danio rerio) were obtained from the stock of the Faculty of Sciences of our University. Prior to spawning the breeding tanks were equipped with a 2 mm maternity mesh for the eggs to fall through to the bottom of the tank. Adult zebrafish with a 2:1 male-female ratio were left undisturbed overnight. The eggs were collected 30 minutes after lights were automatically turned on the next morning. Eggs were rinsed in previously filtered (grade No.1 Whatman paper) aquarium water at 28°C. The embryos were selected to be in a stage previous to 2 hours postfertilization (hpf) and were maintained at 28°C until analysis. Seven percentage dilutions were made to determine the toxicity of samples, using filtered aquarium water as vehicle. Three synchronized embryos at 2 hpf stage were individually exposed in 1.5 ml tubes. All the samples had three replicates with each dilution and 63 embryos were used as negative control on filtered aquarium water. Exposures were completed on a 14: 10 h light: dark cycle at 28°C, with 75% water changes once a day, in order to have optimal oxygen conditions for the embryos. Embryos were evaluated for mortality at 72 hpf. The median lethal dilution (LDil50) was estimated based on the Trimmed Spearman-Karber method for median lethal concentrations (Hamilton et al., 1977) using “The median lethal concentration” software from the USA-Environmental Protection Agency (2005). Five dilutions were made for each sample taking the corresponding LDil50 (lethal dilution) as the starting point: 20% of the LDil50, 10%, 4%, 2% and 0.2% solutions were prepared. The embryos were placed in 1.5 ml tubes and exposed under the same conditions for the Toxicity test. Embryos were transferred into 24 well-plates and examined using an inverse microscope (model Wild Heerbrugg) for developmental abnormalities: yolk sac edema, somite formation, head, tail and heartbeat at 24, 48, 72 hpf. Control embryos at 48 hpf should be between the high pec and long pec stage (Kimmel et al., 1995), therefore embryos which had not reached this stage at 48 hpf were regarded as delayed. Egg coagulation was considered as a criterion for lethality (OECD, 2012). 45 embryos were used for the negative control. All these data were analyzed by a non-parametric Kruskall Wallis test, using the Statistical Package for Social Science (SPSS) IBM version XXI and the graphs were generated using the STATA® program, version 7 and Excel® from Microsoft Office. Table 2 shows the principal physicochemical parameters evaluated on river and industrial discharge samples. Temperature was higher in industrial discharges (20.46-37.03°C) than in river samples (18.88-19.17°C). The most acid pH value was found in QCID (pH 6.6) and the most basic was Xochi (pH 8.19). REDOX potential (ORP) was negative in all the samples (-9.27 to -269.5), DO was equal to zero in most of the samples, or lower than 1. TSD and PO4 were above the permissible limits in all the samples, whereas COD were below permissible limits only in Tepetitla and Confluence. With respect to heavy metals (Al, Ni, Cr and Zn) the NOM-001-SEMARNAT-1996 has not been revised in this subject and establishes very high permissible limits in comparison to the US Federal Law for Protection of Aquatic Life. Taking the values in the latter as a reference, heavy metals in the samples exceeded the permissible limits both in river samples and in industrial discharges. Average ± e. e. Values in bold, do not comply with permissible limits. ORP (Oxidation-Reduction Potential); DO (Dissolved Oxygen); TDS (Total Dissolved Solids); COD (Chemical Oxygen Demand). *If no other units indicated. 1Federal Law, Applicable Provisions Pertaining to National Waters (Use III Protection of Aquatic Life). 2NOM-001-ECOL-1996. 3Unique measure. Table 2: Physicochemical parameters evaluated on industrial discharges and river samples. These data were used in a hierarchal cluster analysis which generated two groups with a similarity above the 82% (Figure. 2), the first group was constituted by industrial discharges and Villa Alta river sample, and the other group consisted of the rest of river samples. QCID discharge was the most different and placed apart. Figure 2: Hierarchichal cluster analysis of physicochemical parameters showing the similarities among the samples from different stations along the Atoyac and Xochiac rivers. A lethal dilution 50 (LDil50) was found for each sample (Table 3); two industrial discharges and Villa Alta river sample had LDil50 values at percentual dilutions of less than 1.0 % and the other river samples had LDil50 values ranging from 1.2-11.3 % percentual dilutions. Survival in the control (aquarium water) was of 85% at 72 hpf. *Given as the percentage of undiluted samples representing 100%. ‡Dilution factor necessary to obtain LDil50. Table 3: Median Lethal Dilution (LDil50) at 72 hpf (Toxicity test). In spite of using dilutions as high as 0.2% taking LDil50 as the starting point, water samples from industrial discharges and Villa Alta were still highly toxic, as is shown in Table 4 where dilutions of 1:41,500 to 1:66,000 still produced embryo mortality from 19 to 45%, whereas lower dilutions ranging from 1:900 to 1:1,750 of river samples produced less mortality ranging from 4 to 35%. Dilutions allowing survival of the embryos produced teratogenic effects, being more frequent in samples from the industrial discharges and Xochi on the Xochiac River, at 24 hpf. River samples from Tepetitla, San Rafael and Confluence presented the lowest proportion of malformed embryos (Table 4) at the concentrations used, however, the dilutions were not comparable, as can be seen from this table; for this reason, the No Effective Dilution and the Lowest Effective Dilution values were used in order to establish a comparison of the teratogenic potential of each sample, finding, again, that industrial discharges and Villa Alta showed the highest potential (Table 5). *Proportion over the survival fraction of embryos; several showed multiple malformations. The control group did not show malformations. YSE – yolk sac edema. Table 4: Number of malformed embryos exposed to samples of industrial discharges and water from Atoyac and Xochiac rivers (24 hpf). (Ã¢ÂÂ) No greater dilution was tested. Table 5: Comparison of the teratogenic potential of samples. Malformations observed included: yolk sac edema (YSE), non lineal extension of the tail (NLET), asymmetry of the head (HA) and lack of eyes (AO) and other (Figure 3). These malformations were found with all the water samples except that of Confluence station which produced no head malformations (Table 4). Embryos showing more than one malformation were frequent as can be seen in data from Table 4 and Figure 3. Embryos showing anencephaly were dead by 24 hpf. Figure 3: Malformations in developing embryos: a) yolk sac edema, b) pericardial edema, c) pericardial edema, d) nondevelopment of the head and tail, e) no formation of head and no somites, f) head malformation and lack of somites, g) malformation of head and eye, h) malformation of head and yolk sac, i) lack of development of structures: head, somites, tail, j) accessory structures in the yolk sac and malformed tail, k) bifurcated tail, l) pericardial edema and non-linear extension of the tail. Heartbeat rate (HR) suffered a decrease on exposed embryos after 48 and 72 hpf with every water sample. Figure 4 shows a decrease with the dose-effect at 48 which was maintained at 72 hpf. Figure 4: Heartbeat decrease. A-controls, b – 0.2%, c – 2%, d – 4%, e – 10%, f – 20%, all are percentages of the corresponding LDil50. The same order is kept for each post-fertilization time. Each bar is the mean of all the stations at each dilution. A clear decrease of heartbeat is observed at 48 and 72 hr post-fertilization. Delays were found in development, being more frequent with water samples from Villa Alta, IDVA, IDMO and IDQC. Furthermore, we observed an arrest phenomenon on embryos treated with IDMO and IDQC samples, which produced embryos detained at the gastrula stage until the end of the test, although death did not occur (data not shown). Latin American countries have incipient environmental vigilance for polluted sites if any. Although there exist some water monitoring programs, it often happens that there is no financial support for long-term programs of surveillance. Methods such as FET would be good alternatives for the performance of monitoring programs and should be considered in Mexican water regulations. In this work, we were able to demonstrate that biomonitoring with FET could be used not only to determine the level of toxicity in rivers but also to identify hotspots of pollution, using an as example a highly polluted Mexican river. Water samples from seven stations along the Atoyac River and one in the Xochiac River were studied in the FET with zebrafish. The test allowed us to determine that the toxicity present in these samples was high irrespective of whether the samples had been taken directly from the discharge pipes or several kilometers away downstream. In order to lower the toxicity by 50% (lethal dilution 50) it was necessary to dilute the water more than 1:100 for the industrial discharges and Villa Alta station and more than 1:35 for the water in the river. Tepetitla, which was the most distant station from industrial discharges (approximately 5.13 km), had a 1:9 dilution in order to achieve LDil50. In spite of using further dilutions from the LDil50 in the teratogenicity test, dead embryos were still found in all the dilutions used. The same percentual dilutions were used for the teratogenicity test, taking LDil50 of each station as a reference, for this reason the final dilution used in each station was different. In the surviving fraction of the treated embryos, malformations were found with all the samples and in all the dilutions which reached levels of 1:41,500 to 1:66,000 for industrial discharges and Villa Alta (Table 4). Teratogenic effects with samples from river stations were observed with dilutions ranging from 900 to 1,750 (Tepetitla, San Rafael, Xochi and Confluence) considerably lower than those of the industrial discharges, and greater dilutions were no longer teratogenic (Table 5). The sample from Tepetitla showed a proportion of malformations similar to Confluence and San Rafael with a lower dilution (1:900), signaling this point as the relatively less toxic of the stations tested (Table 5), which was expected since it is the most distant from the industrial discharges (Figure. 1). This is an important result, suggesting a possible natural attenuation of pollution in the flowing water, of course it could have happened that some contaminants were retained in the sediments, others were filtrated to the groundwater and some more evaporated into the air, contaminating other matrixes, however, the water of the river was not so toxic or teratogenic at this point. The distance between the last discharge (VAID) and Tepetitla is of approximately 5.13 km as has been said. A similar effect was seen in the stations Xochi and Confluence which are 6.2 km downstream from the IDMO discharge which was highly toxic and arrives first to the Xochiac River and from there it flows down to the Atoyac (Figure. 1 and Table 5). Station Xochi is located a few meters before the Xochiac river flows into the Atoyac and at this point its teratogenic potential was half that of the MOID discharge, situated 6 km upstream (Figure. 1 and Table 5). Confluence is located a few meters downstream the confluence of Xochiac River with the Atoyac River and its teratogenic potential was diminished by half (Table 5) with respect to the Xochi station suggesting that the water of the Atoyac river diluted the teratogenic compounds carried by the Xochiac at this point. 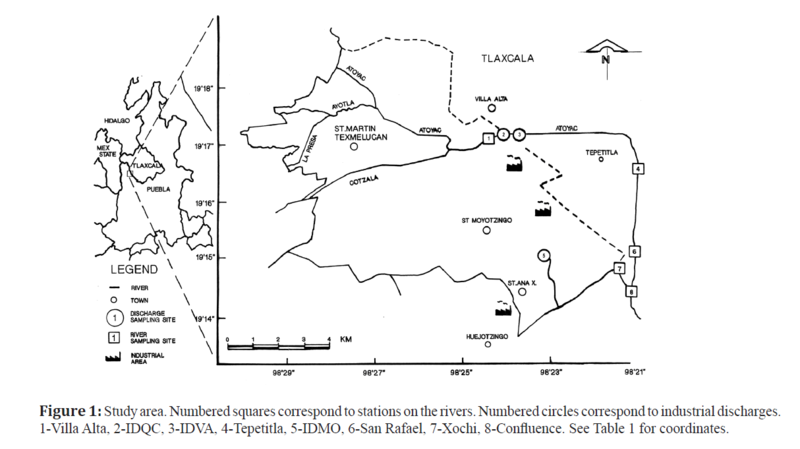 San Rafael station, in turn, had a higher teratogenic potential than Tepetitla, located 3.5 km upstream (Figure.1), which suggests that in between this distance there was another source of toxicity added to the river, which we could notice from the milky bluish color of the water in San Rafael. This station was located a hundred meters before Confluence. The river flows mostly undisturbed, but occasionally, wastes transported in trucks are clandestinely discharged during the night in this part of the river (personal communication by a resident on the zone). No dose-response was found within each sample and No- Effect Dilutions were found only with three river samples (Table 5). This result gives information about the toxicity of the water showing that irrespective of the dilution tested, they were still able to cause developmental alterations probably due to different compounds acting at different levels during embryogenesis as was suggested by McCollum et al. (2011) in their review of developmental toxicity in zebrafish caused by a wide variety of compounds. It also demonstrates the sensibility of the biomarkers which were manifest at low levels of contaminants; the fact that negative controls did not show malformations points to their specificity. Notwithstanding, differences among stations were found, as has been said, with greater teratogenic potential in Villa Alta (sampling station in the river), and the three industrial discharges IDQC, IDMO and VAID which is coincident with the hierarchichal cluster analysis of the physicochemical parameters; Table 5 shows the order of their teratogenic potential according to the dilution factors used and the observed effects. It can be seen, for example, that the sample from Villa Alta was 130 times more teratogenic than the sample from Tepetitla since it required a 66 times greater dilution in order to produce twice the amount of malformations. In a similar manner, there was coincidence with the lethality data, measured by the LDil50 (Table 3) where the industrial discharges and Villa Alta are the most lethal, whereas the stations on the rivers carry less toxicity and were less teratogenic. The fact that the physicochemical parameters measured are coincident with undesirable biological outcomes like lethality and malformations in the FET test demonstrate that the former are predictive of biological risks, which is not always evident, particularly to decision makers in Latin American countries (Melnick et al. 2005). Other biological responses evaluated included delayed development of embryos and it was found that samples from the industrial discharges and Villa Alta caused delay in more than 50% embryos and it continued until 72 hps when observations were stopped. The river samples, however, also produced delay of development in considerable amounts and in variable dilutions, whereas the controls did not produce this effect. Similar delays in development were reported by Usenko et al. (2012) in relation with PBDE exposure, identifying that genes involved in stress response, thyroid hormone regulation and neurodevelopment had been up-regulated. Lastly, heartbeat frequency was decreased in exposed embryos, at 48 and 72 hpf (Figure. 4). This parameter was the only one observed in all the stations that showed a relation with the dose. Reduction of cardiac activity has been reported as a characteristic morphological abnormality related with atrioventricular conduction block by exposure to PAHs and pollutant mixture in zebrafish, as well as being the source of other developmental alterations (Icardona et al., 2004; Wu et al. 2010). Compounds producing pericardial edema also produced bradycardia and decreased erythrocyte flow, like TCDD, benzene, toluene and BPA (McCollum et al. 2011). This parameter shows that the distance from the industrial discharge was not enough to attenuate the contaminants that affect heartbeat in developing embryos and that adverse effects were induced by all the samples taken. In the Balsas basin, which is the second most extensive hydrological land in Mexico, approximately 25 industrial discharges contribute with 119,000 cubic meters of wastewater each year. According to the Mexican Institute of Water Technology (IMTA), more than 128 chemical substances had been detected in the High Balsas River such as chlorines, benzenes, phthalate esters, xylene, toluene, chloroform, lead, chromium, arsenic, mercury, vinyl chloride, VOCs and PAHs (CONAGUA, 2008). The results obtained with the FET in zebrafish demonstrate that a mixture like the one found in this river is not biologically friendly and it is urgent to establish programs to reduce the pollution in this important source of freshwater. Rivers provide freshwater necessary for life and for all human activities and it is paradoxical that rivers are the first and most affected by accelerated growth in industrial activity and population and even more that authorities and industries give for granted that rivers may provide under such pressure without being affected. For quality assurance of these sources of water, it is necessary to protect the rivers from industrial discharges and accidental spills by isolating the pipelines and conducting the water to treatment plants where the contaminants are effectively removed, but it is also important to establish monitoring programs that include physicochemical analytical tests for the detection of toxic chemicals, and tests that allow the determination of the compatibility of this water with life; for this, tests with whole living organisms like the one used in this study, should be the choice. It is important to remember that contaminants in the rivers do not remain there, but they have environmental mobility either physical, incorporating into other environmental matrices like soil, groundwater and air (Rathbun, 2010), or they may incorporate in the food chain (Chary et al., 2008); also, that most of these contaminants are lipophilic and able to reach every tissue in living organisms (Jandacek and Tso, 2001), including developing human embryos and fetuses (Alvarado et al., 2013) altering their biological functions. In either way, terrestrial species, animal or plant, as well as humans are at risk of exposure and their structures are at the same risk of suffering alterations like the ones found in this study. The FET test in zebrafish was useful to ascertain the quality and capacity to sustain life of the water samples taken at different points along the Atoyac and Xochiac rivers which flow through an industrial area. It was useful to confirm again that the water in this area contains a highly toxic mixture of compounds that require dilution factors ranging from 35 to 100 in order to allow 50% of the embryos to survive, and of more than 60,000 to reduce the teratogenic effects. This quality of water is not compatible with life which is a risk for this environment where the river provides for agriculture and for human activities. Considering the high pollution present in the upper Balsas basin, it is urgent to establish an environmental program to stop polluting these rivers and to assure quality of life to the communities at their banks. To Javier Belmont, Antonio Araujo and Fernando Aguilera for their support during field and laboratory work. This research was part of the undergraduate thesis of Soledad Solís. We also acknowledge the Faculty of Sciences Aquarium at UNAM for providing advice during the project. Alvarado-Hernandez, D.L., Montero-Montoya, R., Serrano-García, L., Arellano-Aguilar, O., Jasso-Pineda, Y &Yáñez-Estrada, L., (2013).Assessment of exposure to organochlorine pesticides and levels of DNA damage in mother-infant pairs of an agrarian community.Environmental Molecular and Mutagenesis.54(2):99-111. Barillet, S., Adam-Guillermin, C., Palluel, O., Porcher, J.M &Devaux, A. (2011). Uranium bioaccumulation and biological disorders induced in zebrafish (Daniorerio) after a depleted uranium waterborne exposure. Environmental Pollution.159(2):495-502. Botelho, R.G., Rossi, M.L., Maranho, L.A., Olinda, R.A &Tornisielo, V.L. (2013). Evaluation of surface water quality using an ecotoxicological approach: a case study of the Piracicaba River (São Paulo, Brazil ). Environmental Science and Pollution Research International.20(7):4382-4395. Braunbeck, T., Böttcher, M., Hollert, H., Kosmehl, T., Lammer, E., Leist, E., Rudolf, M& Seitz, N. (2005). Towards an Alternative for the Acute Fish LC50 Test in Chemical Assessment: The Fish Embryo Toxicity Test Goes Multi-species – an Update. ALTEX.22(2):87-102. Chary, N.S., Kamala, C.T&Raj, D.S. (2008). Assessing risk of heavy metals from consuming food grown on sewage irrigated soils and food chain transfer.Ecotoxicology and Environmental Safety.69(3):513-524. Gartiser, S., Hafner, C., Hercher, C., Kronenberger-Schäfer, K&Paschke, A. (2010).Whole effluent assessment of industrial wastewater for determination of BAT compliance. Part 2: metal surface treatment industry. Environmental Science Pollution Research International.17(5):1149-1157. Hamilton, M.A., Russo, R.C&Thurston, R.V. (1977).Trimmed Spearman-Karber method for estimating median lethal concentrations in toxicity bioassays.Environmental Science and Technology.11(7): 714-719. Icardona, P.J., Collier, K.T&Scholz, L.N. (2004). Defects in cardiac function precede morphological abnormalities in fish embryos exposed to polycyclic aromatic hydrocarbons. Toxicology and Applied Pharmacology.196: 191-205. CONAGUA, (2008).Evaluación del riesgosanitarioambiental de laszonasaledañas al ríoAtoyac.Subdirección General Técnica.Gerencia de Saneamiento y Calidad de Agua, Subgerencia de Estudios de Calidaddel Agua e Impacto Ambiental. ComisiónNacional de Agua (CONAGUA). Jandacek, R.J&Tso, P. (2001).Factors affecting the storage and excretion of toxic lipophilic xenobiotics.Lipids.36(12):1289-1305. Karadima, C., Theodoropoulos, C., Rouvalis, A&Iliopoulou-Georgudaki, J. (2010).Ecological risk assessment of cheese whey effluents along a medium-sized river in southwest Greece.Journal of Environmental Science and Health. Part A, Toxic/Hazardous Substance & Environmental Engineering. 45(6):775-781. Kimmel, C.B., Ballard, W.W., Kimmell, S.R., Ullmann, B &Schilling, T.F. 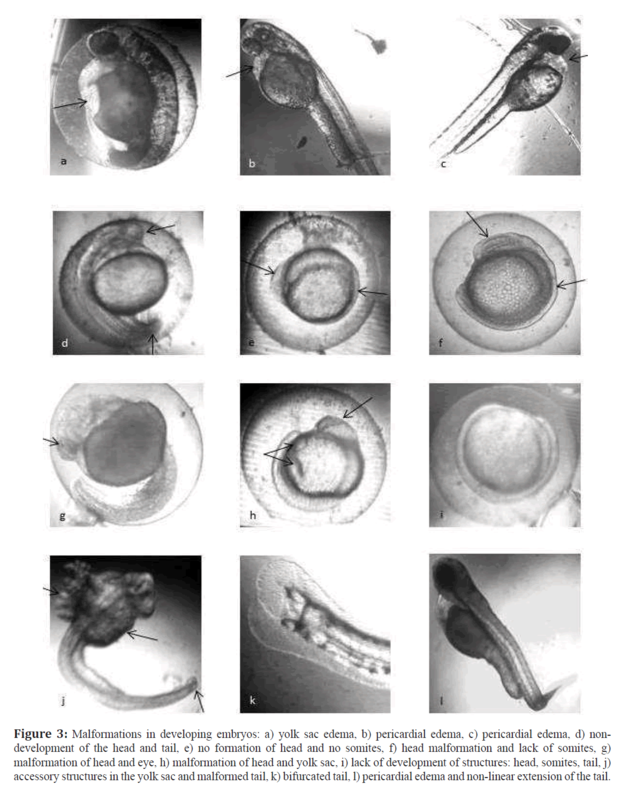 (1995).Stages of embryonic development of the zebrafish. Developmental dynamics: an official publication of the American Association of Anatomists. 203(3): 253-310. McCollum, C.W., Ducharme, N.A., Bondesson, M., &Gustafsson, J.A. (2011).Developmental toxicity screening in zebrafish. Birth Defects Research (Part C). 93: 67-114. Melnick, D., McNeely, D., Kakabadse, Y., Schmidt-Traub, G&Sears, R. (2005). Environment and human well-being: a practical strategy. UN Millenium Project Task Force on Environmental Sustainability. 160pp. Montero, R., Serrano, L., Araujo, A., Dávila, V., Ponce, J., Camacho, R., Morales, E & Méndez, A. (2006).Increased cytogenetic damage in a zone in transition from agricultural to industrial use: comprehensive analysis of the micronucleus test in peripheral blood lymphocytes. Mutagenesis.21(5): 335–342. Navarro, I., Flores, E&Valladares, R. (2004).EstudioAmbiental. In: Morales Eduardo (ed. ), Ambiente y DerechosHumanos. Centro Fray Julián Garcés, DerechosHumanos y Desarrollo Local A.C., Tlaxcala, Tlax, 27–59 pp. Rathbun, R.E., (2010). Transport, behavior, and fate of volatile organic compounds in streams.Critical Review in Environmental Science and Technology.30(2): 129-295. Rocha, P.S., Bernecker, C., Strecker, R., Mariani, C.F., Pompêo, M.L., Storch, V., Hollert, H&Braunbeck, T., (2011).Sediment-contact fish embryo toxicity assay with Daniorerio to assess particle-bound pollutants in the Tietê River Basin (São Paulo, Brazil).Ecotoxicology and Environmental Safety.74(7):1951-1959. Sandoval, A.M., Pulido, G., Monks, S., Gordillo, A.J., Villegas, E.C., (2009).Evaluación fisicoquímica, microbiológica y toxicológica de la degradación ambientaldelrío Atoyac, México. Interciencia.34(12): 880-887. Seok, S.H., Baek, M.W., Lee, H.Y., Kim, D.J., Na, Y.R., Noh, K.J., Park, S.H., Lee, H.K., Lee, B.H & Park, J.H., (2008). In vivo alternative testing with zebrafish in ecotoxicology.Journal of Veterinary Science.9(4):351-357. Usenko, C.Y., Hopkins, D.C., Trumble, S.J &Bruce, E.D. (2012).Hydroxylated PBDEs induce developmental arrest in zebrafish. Toxicolology and Applied Pharmacology.262, 43-51. Wu, L., Chen, L., Hou, J., Zhang, Y., Zhao, J &Gao, H. (2010). Assessment of sediment quality of Yangtze River estuary using zebrafish (Daniorerio) embryos.Environmental Toxicology.25, 234-242.